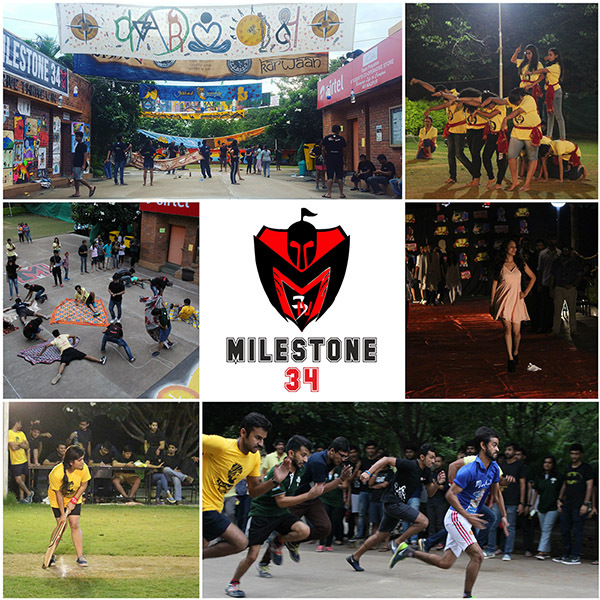 Institute of Management Technology (IMT), Nagpur witnessed its pathways filled with energy and excitement for Milestone 34 (M34), organised by the Milestone Committee. M34 is an intra-college event in which various teams participate to compete in cultural and managerial competitions. The event was inaugurated by Dr Jitendra Sharma and Prof. Pradeep Mazumdar with the lighting of the lamp which was followed by the revelation of this year’s theme – Karwaan. On the registration day, six teams presented spectacular performances and revealed their names. M34 began with a 6 x 6 cricket match, with teams consisting of both boys and girls. The second day of M34 started with ‘Icebreaker’, where the teams presented a small play with a subtle touch of humour. This was followed by ‘Nukkad Naatika’, where each team displayed their acting prowess on a range of social issues, striking a sensitive nerve with the audience and judges alike. On the third day of the event, teams raced each other in promotional runs to secure best possible spots for their offline promotions. Later, the teams faced each other in a ‘Dance-off’, with two dancers representing each team. On the fourth day, the teams dressed up for the ‘Ramp-Age: The Fashion Parade’. Post the fashion parade, the last event was a dance competition, where each team showcased incredible performances. Next, the teams got a chance to display their artistic side, by putting their banners and charts on display, depicting their interpretation of Karwaan. The business acumen of the student managers also came to light when each team put up a base camp by constructing a 3D model to demonstrate a business idea of their choice and entice as many viewers as they could. To understand the ingenuity and creativity of the teams, faculty also came down to observe individual business models and give their reviews. During this four day event, each of the academic forums organised games for the teams to showcase their intellectual and creative abilities. Envision, was an interesting amalgam of games based on TV series and movies categorised in three stages. Inshades, conducted a face painting competition, bringing out artistic side of each team. In Finaholics, the teams were divided into countries, and were made to calculate the financial requirements for various agricultural products. Literati tested the student managers on their knowledge of books and literature across history and cultures. Marque, tested the participants on their knowledge of brands, jingles and advertisements. CSGD conducted an environmental quiz which was followed by a case analysis. Quizwiser rattled the brains of the participants with challenging general knowledge questions. Cyclops conducted a game where the candidates had to optimize production based on market conditions. Okonomos organized an event where the candidates were tested on their money management skills. StrategIT tested property investment aptitudes based on breaking news. XploHRe tested the creativity of students by quizzing them on the concepts of Human Resource Management. The karwaan of M34 came to an end with an exuberant DJ night, where the entire college came together to celebrate a successful completion of M34.